Includes the Muller Peninsula in Alaska and the Sea of the West in North America. l'Amerique divisee Par Grans Etats. 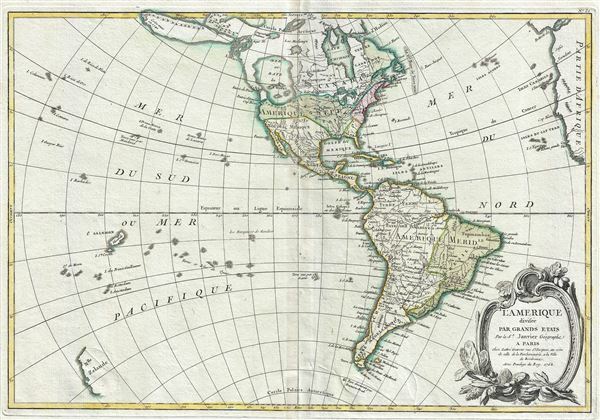 This is an altogether fascinating map of North America and South America by Jean Janvier dating to 1762. It covers both continents from the Antarctic Circle to the Arctic Circle, extends westward to New Zealand and eastward as far as Africa and Spain. This map, which is heavily influenced by the theoretical mappings of Guillaume de l'Isle and Philippe Buache, went through several states of which this is the earliest and possibly the most interesting. By far the most interesting aspects of this map deal with Janvier's treatment of the largely unexplored Pacific Northwest. A magnificent sea called the Sea of the West or in this case the 'Mer ou Baye de L'Ouest,' occupies the greater part of the northwestern part of the continent. This body of water, alternatively called the Sea of the West or Mer de l'Ouest, was speculated by Philippe Buache and Guillaume De l'Isle in the early 18th century based upon wishful thinking, American Indian stories, and the somewhat questionable 16th century explorations of Juan de Fuca. Janvier gives the Mer de l'Ouest its fullest expression, though he stops just short of connecting it to either the network of lakes and rivers extending westward form the Hudson Bay or to the similar network extending westward from Lake Superior. These river and lake networks were being actively explored through the early 18th century by a number of little known but important French explorers. Most specifically the explorations of Verenrye with regard to the discovery of the Lake of the Woods (L. Des Bois) and Lake Winnipeg (L. Ouinipigon), both of which appear on this map. Further north we can find traces of Admiral de Fonte's apocryphal discovery of a passage from the Pacific (starting at the Archipel St. Lazare) eastward via a network of lakes and rivers to Baffin Bay. The De Fonte legend first appeared in a 1706 English publication entitled 'Memoirs of the Curious.' This short-lived magazine published a previously unknown account by a supposed Spanish Admiral named Bartholomew de Fonte. De Fonte is said to have sailed up the Pacific coast of North America in 1640. On this voyage he apparently discovered a series of gigantic lakes, seas, and rivers heading eastward from the Pacific towards Hudson Bay. The De Fonte story relates how, on one of these great inland lakes, he met with a westward bound ship from Boston that must to have come through the Northwest Passage. Today, based upon inaccuracies and falsities, we know the entire De Fonte article to have been a fabrication, however, it set 18th century afire with speculation that a Northwest Passage must indeed exist. Even such luminaries as Benjamin Franklin wrote long defenses of De Fonte. Our map offers an uncommon variant on the De Fonte passage, positioning its western entrada well to the north in order to accommodate the Sea of the West and situating its outlet at the Baffin rather than the Hudson Bay. Even farther to the north we find a striking and exaggerated Alaska-like projection heading in the direction of Asia. This bears some resemblance to the Muller Peninsula postulated around this time based on sightings of the Aleutian archipelago and their misinterpretation as a single land mass. Even more so, given its directional orientation, it bears a significant resemblance to Gamaland or Compagnie Land as imagined by Sanson c. 1705. A note at the very edge of this land mass claims that it was seen in 1741, suggesting either Vitus Bering or Alexei Chirikov. Both did in fact search for Gama or Compagnie land in this year without significant success. On the opposite side of the map, Janvier places the Great Lakes firmly within French territory, a clear case of carto-advocacy. He also extends Spanish control of the eastern coast of North America well north of the traditional Florida boundary to including Georgia and parts of Carolina. South America is typically well mapped along the coastlines and relatively speculative along the interior. Janvier drops the popular myth of Lake Parima and Eldorado in Guyana, but maintains the Lac Xarayes as the northern terminus of the Paraguay River. The Xaraies, meaning 'Masters of the River' were an indigenous people occupying what are today parts of Brazil's Matte Grosso and the Pantanal. When Spanish and Portuguese explorers first navigated up the Paraguay River, as always in search of El Dorado, they encountered the vast Pantanal flood plain at the height of its annual inundation. Understandably misinterpreting the flood plain as a gigantic inland sea, they named it after the local inhabitants, the Xaraies. The Laguna de los Xarayes almost immediately began to appear on early maps of the region and, at the same time, almost immediately took on a legendary aspect as the gateway to El Dorado. Polynesia is mapped with numerous islands named, but few are the correct size or in the correct place. Hawaii, which had not yet been discovered by Cook, is entirely absent. What is shown is 'Terre de Davis' roughly where Easter Island is today. Terre de Davis or Davis' Land was supposedly discovered in 1688 by an English navigator of the same name. Many historians argue whether or not Davis Land was actually Easter Island, but it does seem likely. New Zealand is revealed in an extremely embryonic form in the lower left quadrant. On the western coast is mapped and it has yet to take on the two island form we know today. The lower right hand quadrant is dominated by a decorative title cartouche depicting some of the flora of the continents. This map was drawn by J. Janvier and included as plate no. 31 in the first edition of Jean Lattre's 1762 issue of the Atlas Moderne. Lattre, Jean, Atlas Moderne ou Collection de Cartes sur Toutes les Parties du Globe Terrestre Par Plusieurs Auteurs, Paris, 1762. Very good. Original platemark visible. Minor wear along original centerfold. Blank on verso. Rumsey 2612.069. Phillips (Atlases) 629-32. New York Public Library, Map Division, 96-7687.